Herathera Island Resort, surrounded by a beautiful lagoon and long stretches of white, sandy beach, is the only resort on the island of Herathera, a 20 minute speedboat transfer from Gan International Airport, on the island of Gan. 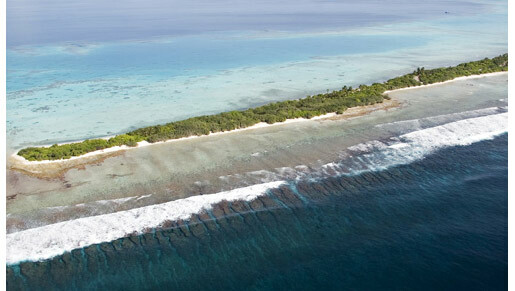 Gan is about a 70 minute flight south of Hulhule International Airport, the main airport near Male’. After about 55 of the 70 minute flight, your flight crosses the equator then continues about 15 minutes to Gan. Three “optional” special choices – Room Service, Beach Dinners for Two, and Gala Theme Night Beach Dinners! Guided Excursions including Snorkeling, Sunset Cruise, Sightseeing Tours to Gan and nearby islands and more! Board games are available from the bars including Chess, Checkers, Scrabble, Caramboard, and more! Music CD’s, Jewelry, Artwork, Crafts, Sundries, Snacks, Magazines, Cigarettes, and more!